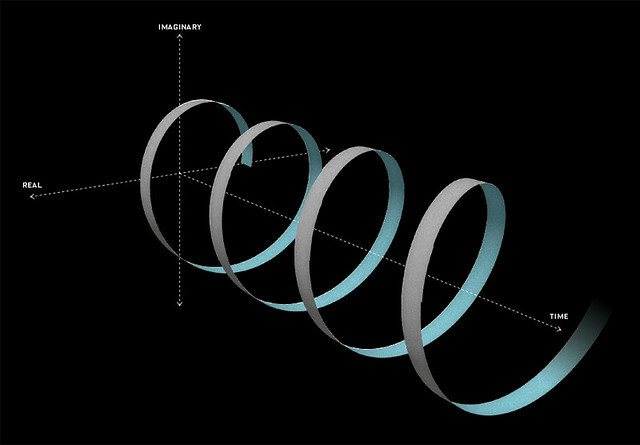 Euler’s identity: Math geeks extol its beauty, even finding in it hints of a myste­rious connected­ness in the universe. It’s on tank tops and coffee mugs [and tattoos]. Aliens, apparently, carve it into crop circles (in 8-bit binary code). It’s appeared on The Simpsons. Twice. 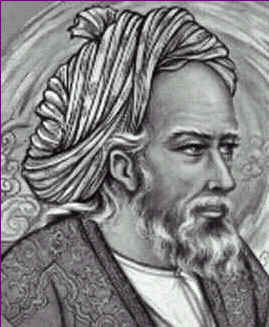 As we wonder if Descartes wasn’t right when he wrote that “everything turns into mathematics,” we might spare a thought for Persian polymath Omar Khayyam; the mathematician, philosopher, astronomer, epigrammatist, and poet died on this date in 1131. 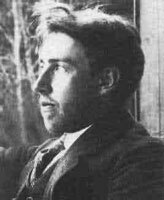 While he’s probably best known to English-speakers as a poet, via Edward FitzGerald’s famous translation of the quatrains that comprise the Rubaiyat of Omar Khayyam, Omar was one of the major mathematicians and astronomers of the medieval period. He is the author of one of the most important works on algebra written before modern times, the Treatise on Demonstration of Problems of Algebra, which includes a geometric method for solving cubic equations by intersecting a hyperbola with a circle. His astronomical observations contributed to the reform of the Persian calendar. And he made important contributions to mechanics, geography, mineralogy, music, climatology, and Islamic theology. If physicists and mathematicians can’t be rock stars, they can at least have rock star logos. Dr. Prateek Lala, a physician and amateur calligrapher from Toronto has obliged with 50 nifty “scientific typographics” of important cosmologists and scientists through the ages. Inspired by the “type biographies” of Indian graphic designer Kapil Bhagat, Lala designed his logos to make the lives and discoveries of various scientists more engaging and more immediately relatable to students. Dr. Lala’s work was for a poster that was published in the latest issue of Inside The Perimeter, the official magazine of Canada’s Perimeter Institute for Theoretical Physics. One can subscribe to the magazine by email for free here. 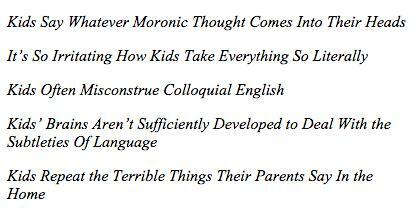 Meantime, one can read the backstory, and see many more of Dr. L’s lyrical logos at CoDesign. As we ponder personal branding, we might send dynamic birthday greetings to Daniel Bernoulli; he was born on this date in 1700. One of the several prominent mathematicians and physicists in the Swiss Bernoulli family, Daniel is best remembered for or his applications of mathematics to mechanics, especially fluid mechanics, and for his pioneering work in probability and statistics. His name is commemorated in the Bernoulli principle, a particular example of the conservation of energy, which describes the mathematics of the mechanism underlying the operation of two important technologies of the 20th century: the carburetor and the airplane wing. 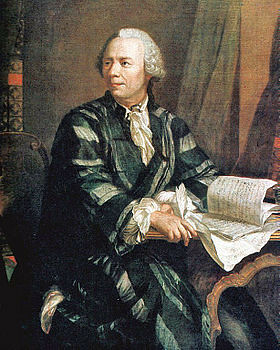 A contemporary and close friend of Leonhard Euler (see above), Bernoulli was the son of Johann Bernoulli (one of the early developers of calculus), nephew of Jakob Bernoulli (who was the first to discover the theory of probability), and the brother of Johann II (an expert on magnetism and the propagation of light). Daniel is said to have had a bad relationship with his father: when they tied for first place in a scientific contest at the University of Paris, Johann, unable to bear the “shame” of being compared as Daniel’s equal, banned Daniel from his house. 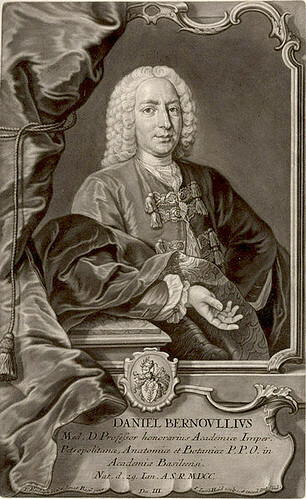 Johann Bernoulli then plagiarized some key ideas from Daniel’s book Hydrodynamica in his own book Hydraulica, which he backdated to before Hydrodynamica. Despite Daniel’s attempts at reconciliation, his father carried the grudge until his death. 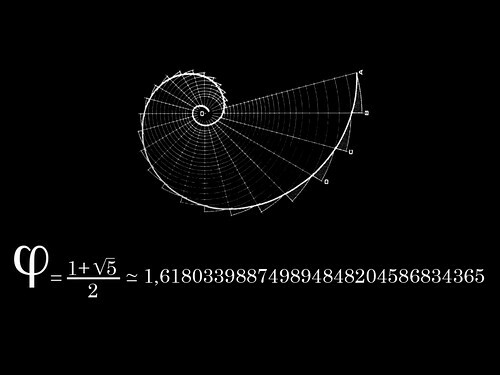 As we remark that math really is beautiful, we might send elegantly parsimonious birthday greetings to one of Fibonacci’s spiritual descendants, a father of Pure Mathematics, Leonhard Euler; he was born on this date in 1707. 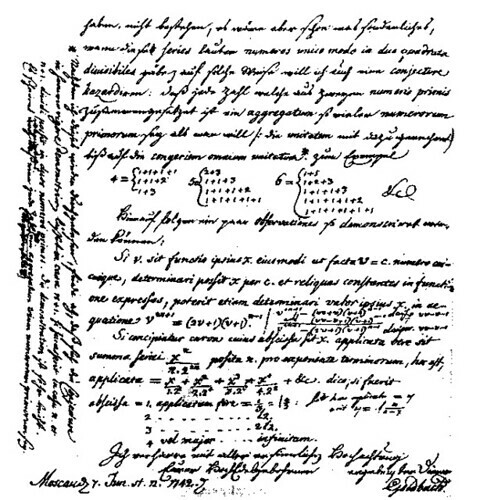 While crafting “the most remarkable formula in mathematics,” Euler made foundational contributions to number theory, graph theory, mathematical logic, and applied math; he originated many commonly-used figures of mathematical notation, and invented the concept of the “mathematical function.” And he was no slouch in physics either, making renowned contributions in work in mechanics, fluid dynamics, optics, and astronomy.